Discussion in 'General Attire & Accoutrements' started by Flieger, Jun 13, 2007. Hope this is the right place for this post? Othervise, feel free to remove/move it to the correct location. I bought these boots a couple of years ago but I have never used them because they have heel-irons and leather soles. The heel-iron makes a lot of noice and is very slippery when I walk on hard surfaces. The leather sole is likevise slippery in a country that has six months of snow and ice. Moving along to my query: Does any one here know if it's possible to remove the heel-irons and attach some kind of rubber sole for traction? Would that ruin the boot? I think they look cool so I'd like to start wearing them. 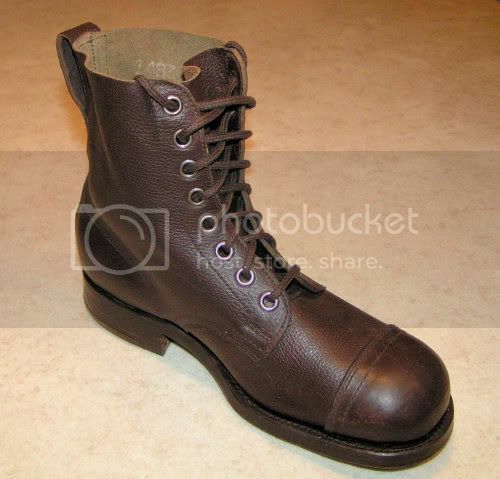 You could have the boots re-soled if you really wanted. Personally, I'd keep the heel irons and even attach some hobnails. We've had some good discussion recently over in the adventurers gear thread about vintage mountaineering boots. 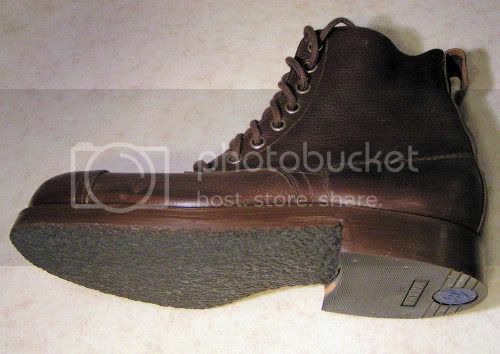 Where did you purchase your Swedish army boots? They look great! Mike K: I bought them here, they still have them in sizes 42, 43 and 44. Never been used. Adding hobnails... Hmm, I'd better go and read that adventurers gear thread. Any cobbler or shoe repair shop should be able to install a rubber oversole (often called a Topy) for $20 or less. He may be able to do rubber toplifts on the heels, as well. I'm franticly looking trough my dictionary but it refuses to give me the translation to "oversole", "Topy" and "toplift"... Could you please explain a bit further? Try 'stick-on soles'. Any shoe repairer can do this. Time for a visit to the local cobbler. Sorry, Flieger. As Alan said, a Topy or oversole is a layer of textured rubber that is glued to the bottom of the leather sole. 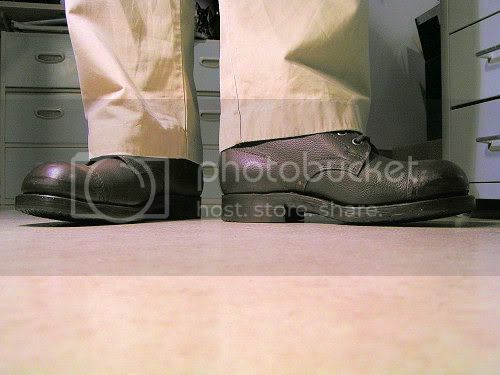 A toplift is sort of the same thing on the heel. Now I have a visual image of what I need to ask the cobbler for. Well, boots are packed and it's time to head out on my mission. Fingers crossed. Back from the cobbler, $57 less in my wallet. Living in the age of the digital camera, I'll post photos as soon as I get them back. Thinking about it, I'm sure I could have glued the soles on myself and saved me both time and money... oh, well. I got the boots back today with the rubber soles fitted. Man, they did a great job! BT and Speedster: Go for it! I doubt you'll find a better pair of boots for 175 SEK. Flieger, i was way too slow to react and the source you linked to has ofcourse run out of stock. Do you know of any others who might have them? I think they were all gone about 6 months ago... maybe more. I've been trying to find some good surplus stores in Sweden(now that I'm living here) but not really found much yet. So... Flieger, I need some too. Hi BT; hope all is well with you and the family. Enjoying Stockholm? I got a pair of those boots, too.